The Muriel Kauffman Theatre presents a diversity of entertainers and performances from around the world, including pop and country entertainers, Broadway productions, comedy shows, and more. The Kauffman Theatre is also the performance home of the Kansas City Ballet and Lyric Opera of Kansas City. The 1,800-seat venue is designed to be visually striking, yet retain an intimate experience for both audiences and performers. Inspired by the great opera houses of Europe, audiences are seated in a vineyard-style, semicircle configuration facing the stage—bringing them closer to the performers than in traditional auditorium-style proscenium venues. Audience seats that are 22-24 inches in width provide maximum comfort. 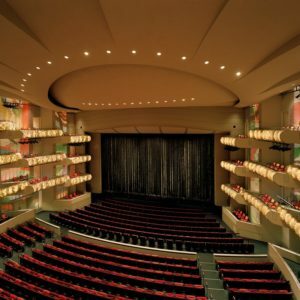 The design of the Muriel Kauffman Theatre’s expanded facilities provides dramatically enhanced performance capabilities—including a vast 5,000-square-foot stage; a larger orchestra pit that can accommodate 95 musicians; increased backstage facilities; a 74-foot tall fly tower; and a flexible proscenium stage opening. The theatre’s fly tower allows for scenery as tall as 30 feet to be flown above the stage, allowing productions to make use of more sophisticated scenic design elements. The stage’s flexible proscenium opening allows the width and height of the stage to be adjusted, making it tremendously adaptable and allowing for both intimate and larger-scale productions. The theatre also offers the Figaro supertitle system, with a personal monitor mounted on each individual seatback for productions requiring translation.